WARNING: Changing your own timing belt is not for the faint of heart! If you screw it up, your engine may not run! However, if you are confident in your abilities and generally do your own work, you should be able to handle it. Changing the timing belt requires no special tools. You will probably want to have a 14mm deep well socket, a 3" extension for your 1/2" drive, and you may want a steering wheel puller to remove the crankshaft pulley. (It shouldn't be necessary) Also, you may want a second pair of hands to hold the camshaft pulleys steady while you install the new belt. You will also need something to drive the new crankshaft and camshaft seals in. An appropriate piece of pipe, covered with electrical tape to prevent cutting the seal worked well for me. A long breaker-bar will be needed to remove the crankshaft bolt. It is basically a large washer (I think it was a 1 1/2" washer) that fits over the crank bolt and then there are holes drilled in it for the 10mm bolts. I then welded a piece of 1/2" keystock as a handle. The handle can be blocked any number of ways. 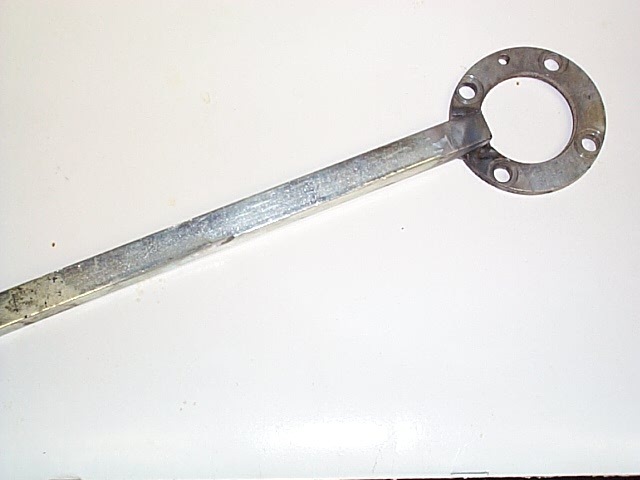 Archie Glasgow sent in this photo of a homemade tool that keeps the engine from turning while removing the bolt. We haven't tried it, but we see no reason why it wouldn't work. You may be able to get away with not replacing this, but its only a $20 part and isn't really worth taking the risk of a leak. They need to be removed anyway, so it can't hurt to replace them now instead of waiting until they break. You need to drain it anyway, so if you haven't replaced it in the last year, you might as well do it now. Miq Millman recommends replacing the Woodruff key (about $5) as a precaution. I haven't done it myself, but it can't hurt to do so. Check for leaks and replace them if necessary. You need to remove the timing belt to replace the water pump. A water pump may last anywhere from 70,000 to 170,000 miles. We waited - ours lasted a long time. You need to decide. You'll save a lot of labor if you do it now, and water pumps are under $100. Before you begin - LABEL EVERYTHING!!!! Label each part as it is taken out and also label its bolt sizes and what the part was connected to/in/between. This aids in any confusion to the novice engine worker. Into a suitable container and save it for reuse or, if you plan to replace it, for recycling. Remove the hose clamps at each end and one bolt. Also take off the chrome air pipe that runs across and into the valve cover. Remove the two water hoses connected to the thermostat housing. Optional: Remove the cooling fans and the radiator. This will give you a lot more room to work. It isn't too hard. There is an electrical connector on each fan. Remove the 2 bolts at the top and bottom of each fan and lift them out. 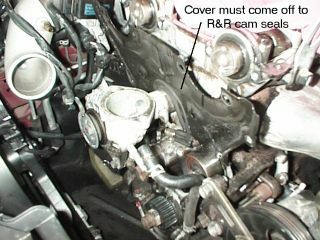 Disconnect the lower coolant hose from the radiator (accessible from the trap door on the debris shield underneath) and remove the two upper bolts holding the radiator in place. Lift out the radiator and carefully put it aside. Be careful not to damage the cooling fins on the radiator. The are easily distorted. Note: If you lift out the radiator, the fans come with it and you save yourself a bit of hassle trying to loosen up those 8 corroded bolts that bolt the fans to the radiator. Loosen the tensioner bolt, pivot bolt, and lock bolt on the power steering pump housing until the belt can be slipped off. Disconnect the ignition wires from the plugs. Remove the spark plugs. This will make it easier to turn the engine later. Crack the 3 bolts holding the water pump pulley on before loosening the belt. If you do happen to remove the belts before loosening the water pump pulley bolts, you can hold the pulley in place by wrapping the belt back around the pulley and holding it tightly, as close to the pulley as possible. Loosen the alternator tensioner bolts. The bottom bolt can be difficult to get to. 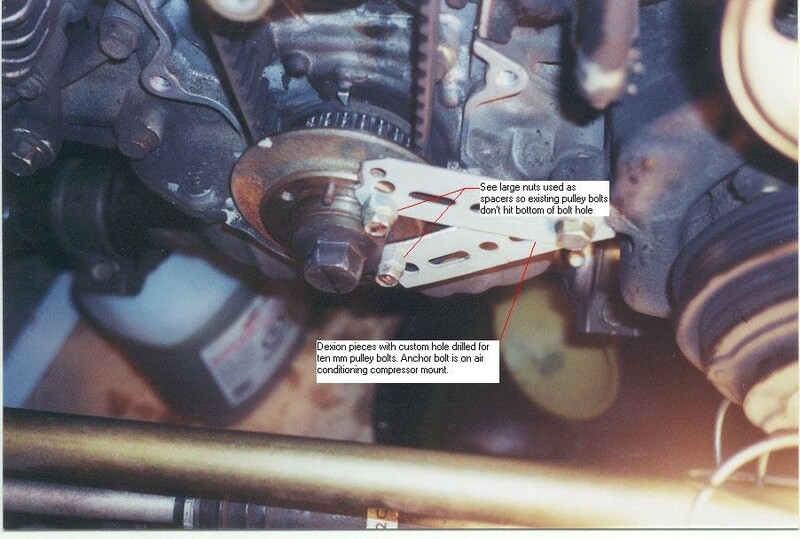 1990 - 1991: Remove the accessory belt pulley from the crankshaft pulley. This is easier if you put the car in gear to keep the engine from turning. Loosen the bolts holding the pulley in place. As you remove the outside plate, pulley, and timing belt guides, make a note of the order in which they came off and the direction they face. This is important. 1992 and later: Remove the 21mm crankshaft bolt. This will be difficult. Put the car in 5th gear and engage the parking brake. Using a long breaker bar, crack the bolt loose. Remove the 3 timing belt cover plates. These are easy to remove. First remove the upper plate, then the middle plate, and finally the lower plate. Be sure to make a note of the various pieces being held by these bolts so you know where to replace them. Before removing the old belt, count the teeth/spaces between all the points that the belt touches on the 3 wheels. Next, mark the starting "space", and ending space on both the belt and cams. This is easily done with some WhiteOut. Remove the belt. Transpose the marks from the old belt onto the new belt, and count the spaces to make sure that they are correct. Finally, match the new marks on the new belt with the marks on the cams/crankshaft. To make it simple to see where things line up, after making sure both the crankshaft and camshaft marks are properly aligned at their 0 degree, 135 degree and 235 degree positions, mark the belt and sprocekts at the 90, 180, and 270 degree positions around the cranshaft sprocket then at the 0 degree secondary marks on camshaft sprockets. By far the best marker I've found for the job is a white Sanford Uni Paint Marker which you can find at ACE hardware stores and probably most others. Chalk, grease pencils and the like can be rubbed off too easily. The paint marker is very precise, dries almost instantly, and won't rub off. Just be sparing with it--small marks will do since they will stay put. Loosen the timing belt tensioner lock bolt. Temporarily secure the tensioner with the spring fully extended. Once the belt has been removed, do not rotate either the crankshaft pulley or the camshaft pulleys. If you do, you will not be able to figure out the proper rotational alignment. TIP: Sean Archer and Vic Harder from the Canadian Rockies Chapter of MCA offered this great tip. We haven't tried it, so we're not sure what kind of caveats might be attached to it, but its sure worth a try! If you're replacing the camshaft seals or water pump as well, you won't be able to do this. When you are ready to remove the old timing belt and apply the new one, cut the old belt in half for its entire length. That leaves lots of room to push on the new belt. Push the old belt back as far as it will go on the crank and cam sprockets, leaving approximately a 1/4" to slide the new belt over. Once the new belt is on and lined up correctly, simply cut the old one off and push the new one into place. TIP: Kim Burgess suggests: Clamping the cams in positions aids the solitary mechanic in reinstalling the belt by 'locking' the cam wheels into position. Place Cresent wrench on each cam at the bolt-shaped section of the cam between the #1 and #2 lobes. Position wrenchs such that they overlap and C-clamp them together to hold camshafs in position. This step is optional. If the seal is leaking, definitely replace it. If not, you may want to let it go until next time. Especially if you have an early model with a "questionable" crankshaft. 1990-'91: Remove the 21mm crankshaft bolt. This will be difficult. Put the car in 5th gear and engage the parking brake. Using a long breaker bar, crack the bolt loose. Remove the timing belt pulley. You may require a wheel puller to get this off. Be extremely careful not to score the crankshaft during the removal. This can cause leaks. The oil seal is a steel ring covered with plastic and rubber. The best way to remove it is to carefully cut the plastic and rubber and pry out the seal with a screwdriver. Be sure to put a piece of cloth between the screwdriver and the metal areas so you don't score anything. This takes a bit of work. Coat the new seal with a bit of oil and press it firmly into place with your hands. You need to drive the seal flush with the oil pump body. A large socket or pipe is good for this. I use a piece of pipe covered with tape to prevent damage to the seal. Drive the pipe against the seal with a hammer until it is seated flush. 1990-91: Replace the timing belt pulley. 1990-91: Install the Woodruff key. 1990-91: Tighten the crankshaft lockbolt to 80-87 foot-pounds. 1992 & later: Install the woodruff key and timing belt pulley. 1992 & later: You will need to install and remove the crankshaft bolt and pulley a couple of times, so install it, but do not torque it down. Belt had obviously been changed recently, almost no gaskets on belt covers, got the seal out and discovered that the crank nose was ok, but the sealing surface had been gouged in several places by some cretin trying to remove the seal, probably at timing belt change time. After much soul searching and not a little deliberation on the familial heritage of the cretin, I cleaned up the sealing surface by filing and grinding with a Craytex rubber/abrasive wheel on a cordless Dremel tool, and changed the seal. Then I thought, what about the camshaft seals? By this time I had realized that removing these seals was a real pain in the posterior and had discussed the problem with a friend who had taught motorcycle repair in a former life. He suggested (here's tip number one) that you can drill the seal with a small drill and screw in a sheet metal screw and pull on the screw to remove the seal. He had a minerature slide hammer puller for this, but vise grips and a hammer work since they aren't very tight. Next he said that he had had cretin gouged motorcycle cranks to repair and had smoothed the crank and then cleaned the gouge and filled it with epoxy (tip number two). When I pulled the seals from the camshafts it was obvious that the same cretin had been there as well. To make it easy to work on the camshafts I pulled the bearing caps and filed the sealing surface smooth and then cleaned and filled the gouges. I used J.B. Weld, which has a long cure time, but it made a very smooth surface when sanded with 600 wet or dry. What I finally found that seemed to be a real good fit was a 1 1/4" coupling ($1.99 at ACE Hardware). This piece has a 1 7/8" o.d., and a 1 1/2" i.d. In addition the ends are finished off and very smooth, so there was no real need to wrap the end with tape. I also used this coupling to set the camshaft seals. The sprocket just pulls off once the bolt is free. The only GOOD way to remove the cam seals is to pull the #5 camshaft cap. Remove the two bolts, place a rag over the cap, and grab gently with a large pair of slipjoint pliers at each edge of the cap. Alternating sides, you can rock back and forth slightly and the cap will come free, and then removal of the seals is a piece of cake with no risk of damage to the cams themselves. One important detail that must not be overlooked is cleaning up the surface where the cap sits on both the cap and the head, and then applying a THIN coat of flange sealant(hylomar is what I use) before reinstalling the cap. Then install the new seals after oiling the inner lip and drive them in until they are flush with the cap. The service manual does not advise bottoming the seals out. If you plan to replace the water pump, now is the time. When you're done, come back here. To replace the sprocket, the dowel pin on the cam shaft should be vertical. The appropriate mark on the pulley - I for intake, E for exhaust, should be facing up when the pulley goes back on. 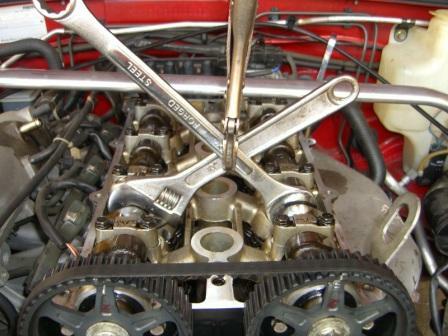 Torque the bolt to 36-45 ft.lb., holding the cam shaft with the crescent wrench as before. Verify that the timing belt pulley mark is aligned with the v-shaped timing mark on the front of the engine. I used small G clamps to keep the timing belt in place on the cam pulleys during the timing setup. Very little pressure is required & it stops annoying belt slips & you can concentrate on getting the crank pulley belt lined up properly. Verify that the camshaft pulley marks are aligned with the marks on the seal plate. CAUTION: Do not rotate the belt counterclockwise. Someone recently did and managed to shear the exhaust cam pulley. You'll require some help installing the belt. Someone will have to hold the camshaft pulleys steady while you thread the belt on. This will take a couple of tries to get it right. Align the timing belt pulley mark with the timing mark. Verify alignment of camshaft pulleys. Be sure the marks on the pulleys are still aligned with the marks on the seal plate. If not, remove the belt and repeat from the beginning of the Replace the Timing Belt section. And align the timing belt pulley with the tension set mark. Loosen the tensioner bolt to apply tension to the belt. Tighten the tensioner bolt to 37-52 Newton Meters. Verify the timing marks are still correctly aligned. Apply about 22 pounds of pressure to the center of the belt between the camshaft pulleys. The deflection should be 9-11.5mm. If not, repeat from the tension setting. '90-'91:Install the timing belt inner guide plate. Install the lower, middle and upper timing belt covers. Apply silicone sealant in the corners where the rounded areas are by the camshafts. '90-'91: Install the timing belt outer guide plate. '90-'91:Install the crankshaft pulley and the plate. '92 and later: Replace the timing belt pulley and crankshaft bolt. Torque to 116-122 foot-pounds. Reinstall the spark plugs and wires. Torque spark plugs to 11 - 17 ft. lbs. Reinstall the water pump pulley and the belts. Tighten pulley to 69-95 inch-lbs. Adjust tension on the two accessory belts. Say a prayer and start it up! At this point its a good idea to check the ignition timing and idle speed. If everything was done correctly, it should not have changed, but it can't hurt to check. I did not scribe the lines on the cam sprockets, as suggested, which with hindsight was probably the wrong thing to do, but I learnt a couple of things that may be worth passing on or adding to the description on your web site. Firstly, although obvious give yourself plenty of time, get some help if possible, and don't be put off... Follow the instruction for setting the timing prior to removing the old belt, and when you do take the timing belt off try to pay attention to how much, if any, the CAMS and crank move. Use a wrench as suggested to realign the CAMs and crank. You might like to add a couple of additional white-out marks to the CAM sprockets where they line up with the top of the cam cover backing plate. Although I made a mistake the first time I ultimately used the factory timing marks and found them to be satisfactory. I failed the first time because I introduced an error when reinstalling the belt. In my efforts to keep the belt tight on the exhaust side of the engine I failed to notice the exhaust CAM sprocket moving slightly as I pushed on the belt. I was so preoccupied with the inlet, which moves slightly when the belt tension is removed, and worried about the crank that I simply didn't notice. I had one issue that I thought might deserve attention in the article. As a newb to this particular project on this car, I was unaware of the importance of the crank trigger wheel - I thought it was just some sort of dust plate. I put it on concave face towards the front of the car...and the car would not run at all. There was not mention of the importance of the orientation of this plate in the article, but a quick search in the forums turned up the issue. I removed the two drive belts and the drive belt pulley on the crank, flipped the crank trigger wheel so that it was facing convex face-forward, put everything back together, and the car started right up and runs perfectly.